A bacon taco shell. Need we say more? Last week I posted a story about a Bacon Weave Taco that I made. 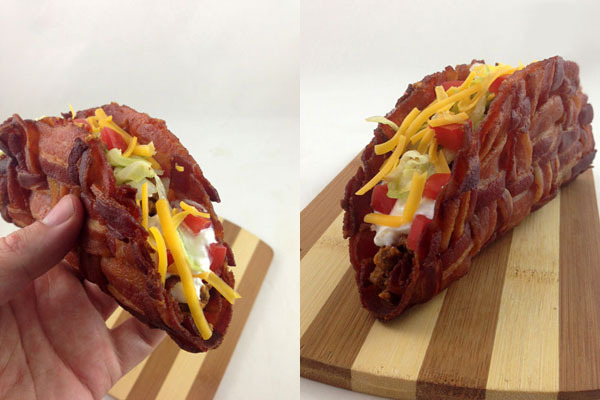 Now, I'm definitely not the first person to make a Bacon Weave Taco, but the problem with most of the ones I've seen is that they just didn't look appetizing to me. It seems like people sort of took the easy way out when making them and just tossed their bacon over a metal object, made sure the strips overlapped a little so they'd stick together and either baked or deep fried it like that so their shells just end up looking like squares of bacon that had been folded in half. Long story short, most of the bacon taco shells out there just don't look very taco-shaped. In the end my Bacon Weave Taco ended up looking -- and tasting -- way better than I ever could have imagined. Once it was done baking I filled it to the brim with seasoned ground beef, sour cream, lettuce, tomato and shredded cheese and took a bite. It was completely amazing, and aside from that the shell, actually looked exactly like a real taco shell! Maybe you're just not a fan of tacos though, and in that case the bacon weave can also be used for such things as a Bacon Weave Quesadilla, a Bacon Weave Breakfast Burrito, a Bacon Weave Grilled Cheese Sandwich or even Bacon Weave Pizza. The possibilities are endless!